When I created the paint dipped vases for our pink and orange party, I really didn’t want to actually dip them in paint because that I thought they were just so cute that I knew I could find another use them. The results of my vase repurpose are these white scalloped storage jars that are equally perfect for storing office supplies as they are fresh flowers. When I first bought them I knew the silver aluminum lids would look much better spray painted gold because, well, just about everything does. So that was the first step in their transformation. Sadly, I was out of gold spray paint so I went to my back up color—a coppery, rose gold color. Since the base of the jars is like a cylinder, it makes it really easy to wrap a decal around them. I reached in my stash of supplies and found some white adhesive vinyl to use. The vinyl is perfect for adding nice, opaque color to class and using my Silhouette to cut it out makes it a piece of cake! 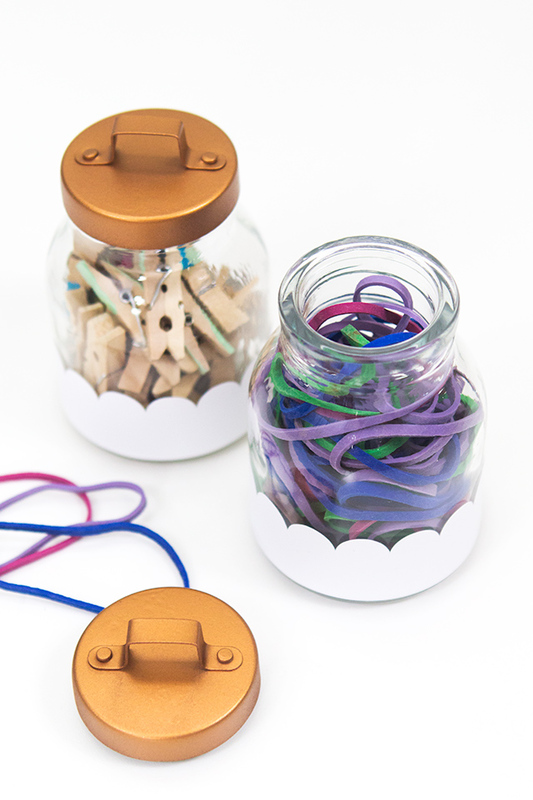 If you want to create your own jars the link to the scalloped template is at the end of this post. I used small jars that I found at Hobby Lobby, that are 22 cm in diameter, but you could easily scale the pattern to make it fit any size jar (these straight-sided jars from The Container Store would also work great). Just look for jars that have a cylindrical shape (i.e. not tapered) on the bottom. These little jars also make great mini vases for fresh flowers. Here they are sitting on a shelf in my home office. Check out some of the other projects I’ve created with my Silhouette here. These craft jars are darling! I was feeling so down today about my blog and not crafting all week then I saw your framed message in this pic and it’s exactly what I needed to see! It really made me feel better ;) Love your blog! So glad it cheered you up a bit! It’s so easy to get down and overwhelmed when you’re feeling behind. That print is such a great reminder!